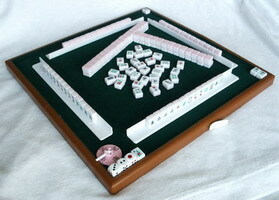 The Jungle Teacher: My First Game of Mahjong! I finally had the chance to learn the game last night (a few hours ago)! However, i enjoyed being taught the game more than playing the game! cz i got a really gorgeous teacher named Jenny! Then, gav her a big shock when i won my very first game! I got so attactched to the game that i went on playing for hours! Many thanks to Ester Yap for arranging the wonderful after church get-together party!